5 Things to Do in Cologne in One Day - Let's Go and Explore! Cologne is one of our favourite German cities. With its magnificent architecture and relaxed vibe, it is one of the best places to visit in Germany. You can easily spend days there and always find new things to do and see. If you only have one day there, then let us show you the five best things to do in Cologne in one day. We have also included another ten alternative ideas for your one day in Cologne. Cologne was heavily bombed during World War II. With the British Air Force dropping more than 35,000 tons of bombs on Cologne Germany in 262 separate air raids, the city was devastated. 95% of the population was either evacuated or killed, and much of the architecture was destroyed. At the end of the war when Germany was carved up between the Allies, Cologne benefitted from its proximity to both Düsseldorf and Bonn. The city underwent a huge regeneration, with many of the destroyed Romanesque churches being carefully reconstructed. Today, it is the fourth-largest city in Germany and home to one of Europe’s oldest and largest universities. The destruction of the city has resulted in a mishmash of architecture that is a contrasting mix of old and new. The most notable landmark is the Dom (cathedral) – the largest gothic church in Northern Europe. Other Cologne sights include the Rathaus (town hall) and the medieval city gates. For us, the imposing Hohenzollernbrücke over the Rhein was one of the best things to see in Cologne! Although the contrasting architecture is not to everyone’s taste, the city itself has a wonderful vibe that is also made up of contrasts. We found Cologne to be relaxed but lively, peaceful but buzzing, all at the same time. Scroll down to find out how you can spend a perfect day on your Cologne trip. The perfect day in Cologne starts with a good coffee. To make your breakfast more memorable, we recommend a coffee at the Fischmarkt (fish market), next to the Rhein River. Whilst there is no longer an actual fish market on the site, it is now an Instagram-worthy and relaxed square. It features colourful buildings, a cute fountain and the impressive Gross St.Martin (Church of Great St. Martin) as a backdrop. Chose one of the many available restaurants and cafes and enjoy your breakfast outside when the weather is good. After your breakfast, you can head directly to the Church of Great St.Martin and marvel at its amazing architecture. This Romanesque Catholic Church was founded in the year 960 on what was then an island in the Rhine River. Especially impressive is its majestic tower! The church was almost completely destroyed in the World War II and was again completely restored in 1985. These days it’s a must-see on every Cologne walking tour. To see Cologne Cathedral from the inside is great, but the best thing is definitely to climb the 533 steps and enjoy the amazing view over Cologne. The south tower of the cathedral is approximately 100m high. It might not be an easy climb, but anyone who’s fit enough and loves good views should definitely do it! You can check the official webpage of the Cologne Cathedral for current opening hours and entrance fees. We loved the great vistas from the south tower! The best place to catch a photo of the Cologne Cathedral is the huge square on the south side of it. There you can also find the “Früh am Dom”, which brings us to the next activity of our Cologne travel guide. Climbing the tower of the Cologne Cathedral makes you quite hungry and thirsty. This is why your next stops should be to visit another of the highlights of Cologne: The Brauhaus (brewery) Früh am Dom. Früh is a traditional brewery in Cologne and has been around more than 100 years. They produce a special beer, only brewed in Cologne, called Kölsch. Kölsch is a light ale with a lovely golden colour and normally comes in cylindrical 0.2l glasses. This seems to be a rather small glass. Be warned though: The waiter will just bring you a new glass as soon as you finished your old one. The traditional way to show that you had enough Kölsch is by putting a beer mat on top of the glass. If you really like German beer, then you should definitely have a look at this awesome Cologne Pub Crawl. Of course, you can also get some delicious traditional German food in the Brauhaus Früh am Dom. This one is for all the hopeless romantics out there. The Hohenzollern Bridge is probably one of the most famous places in Germany where couples place their love locks. In 2013, a German newspaper took the task of counting all the love locks on this Cologne bridge. In about 30 hours, they counted a total of about 150’000 love locks on the bridge! They also estimated that there are about 10 more locks added every hour. Now I leave it to you to work out how many there might be right at this moment. The “Deutsche Bahn” (German railways) wanted to get rid of all those locks first, but after deciding that they don’t cause any danger to the stability of the bridge, they then decided to leave them where they are. We loved this fish love lock! Look at this cute turtle! Their love for each other must be huge! The tradition is to engrave the names of the couple, friends or family who visit Cologne on the lovelock, hang it on the Hohenzollern Bridge and then throw the key into the Rhein River. You’re planning a big Europe trip but don’t know which backpack to get? Then have a look at this helpful Backpacks for Europe post. Every perfect day should end with a sunset! And if you want to experience the best sunset views in Cologne, then you have to go to the viewing platform of the Cologne Triangle building, on the east side of the Hohenzollern Bridge. Taking the lift, you’ll reach the 29th floor of the Cologne Triangle without any effort and in only a few seconds. 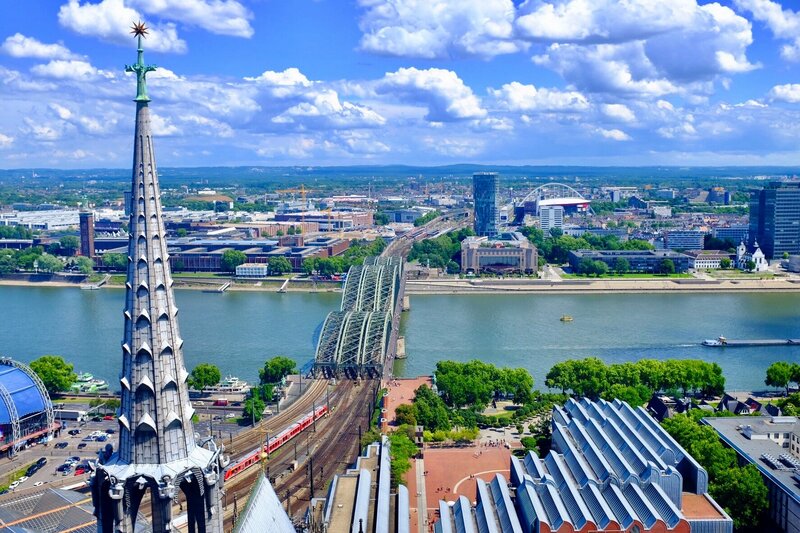 From a hight of 103 meters, you can enjoy a 360 degree view over the great city of Cologne. You can find here the current opening hours and entrance fees. Those 5 things are the core of what to do in Cologne when you only have one day. Of course, there are a lot more Cologne attractions if you end up with time on your hands. So, we want to give you some visual inspiration with the following pictures and give you some alternative things to do in Cologne in one day. If you are interested in sports history, then you should definitely visit the Sport and Olympia Museum in Cologne. You can find the current opening hours and entrance fees on their official webpage. You’re more interested in sweets than sports? Then I’ve got good news for you: Right next to the Sport and Olympia museum you can find the Chocolate Museum of Cologne. Go to their webpage if you’d like to find out more and plan it into your Cologne sightseeing. How about a sightseeing tour from aboard a boat? You love boat tours? Then how about you join a boat tour with a Cologne river cruise? You can book a Cologne Boat Sightseeing Tour here. Or how would you like to visit Cologne on one day as one of the awesome stops during an Rhine River Cruise? This Rhein River Cruise will bring you from Amsterdam in the Netherlands to Basel in Switzerland in 8 wonderful days. Want some time out? Then head to the Rheinpark, north-east of the Hohenzollern Bridge. It’s perfect to just relax and enjoy nature. One of the best places to visit in Cologne if you’re looking for some peace and quiet. Oh, and there is also a Toy Train you can ride. Right behind the Rheinpark, you can find a gondola which brings you to the other side of the Rhein River! After an accident in 2017, it unfortunately stopped operations, but there are rumours that they might resume their business again in summer 2018. This would be awesome, because for us it was one of the best things to do in Cologne! Would you like to discover more of the food Cologne has to offer? Then you can book a Cologne Food Tour and discover local delicacies. If you like awesome architecture, then you should definitely head over to the “Kranhäuser“. You can take a great picture of these Cologne must see buildings from the Severins Bridge. Another great area to visit in Cologne is the Old Market, near the Cologne Cathedral. There, you can find the great Jan-von-Werth-Memorial, the old traditional market scale and a lot of great shops and places to eat and drink. If you like fountains, then you should definitely visit the Willi Ostermann Fountain in Cologne. This beautiful fountain is dedicated to the “first pop-star” of Cologne, Willi Ostermann, who mainly wrote songs about Cologne and especially its citizens. These days, his songs are very popular during the Carnival of Cologne. Another great activity for your one day Cologne itinerary could be to book a Cologne Photo Tour to get the best pictures possible. We loved Cologne a lot. It is one of the cities we had a good feeling about as soon as we arrived. The people are friendly, the vistas are great and there are so many top things to do in Cologne. It’s amazing to see how the city was redeveloped after it was almost completely destroyed during World War II. This great city is definitely worth at least a day in your Germany travel itinerary! If you really want to discover Cologne in depth, then you need probably 2-3 days, but to see and experience the bits, one day in Cologne is perfect. Did you like this post? Then share it on your Pinterest wall. Are you looking for some great day trips in other German cities? Then check out this post about Day trips from Munich. Click here if you want to read more about various European destinations.